WHAT THE HECK ARE INSULATORS? "Insulators? You mean those glass things on the tops of telephone poles we used to shoot out as kids?" This is an unfortunately all-too common response that insulator collectors hear when the subject of insulators is brought up amongst strangers. It is enough to make most of us just cringe. Hopefully, some of what you read here and on other insulator websites might change your views on these little ladies of the wire. Q: What the heck are insulators? A: Insulators are those glass or porcelain things you see on the tops and crossarms of telephone poles. Their purpose is to insulate the electrical wires they carry, so that electricity (or telephone calls) don't all leak into the pole and into the earth. Without insulators, it would be fairly impossible to transmit electricity to homes and businesses, and telephone calls wouldn't go more than a few hundred feet before you couldn't hear the other person anymore. Insulators were first manufactured in quantity in the 1800's when the first telegraph and telephone circuits were put in place. A way was needed to prevent the telegraph signal from draining into the earth wherever the wire touched a solid object. Insulators were invented to fulfill this need. There are hundreds of different styles and colors of insulators today. Many of the older pieces were made from glass or porcelain; however there are some made with wood and glass, animal parts, and other bizarre materials. Smaller insulators were used on telephone and telegraph circuits, and larger insulators were made for electrical (power supply) wires. Generally speaking, the higher the voltage in the power lines, the larger the insulator holding those lines has to be. This is because electricity can actually "jump" over a fairly long path if the voltage is high enough. Insulators with wide "umbrella" disks and wide lower skirts (the flared-out part on the insulator's bottom) are designed to keep the distance between the wire and the pole as long as possible, so that this "jumping" or arcing (technically it's called "flashover") doesn't happen. Q: It's just some old busted up glass. Why collect them? A: Insulator collecting really started getting popular in the 1960s, as more and more utility and electric power companies started running their wires underground. Many of the old insulators couldn't be used there, so they end up being thrown out. Since insulators came in such a large variety of sizes, shapes and colors, it was only a matter of time before they became collectibles. Most insulators in the hands of collectors are between 50 and 125 years old - and most are types that haven't even been manufactured since the turn of the century. If it's old, and if nobody's making them anymore, any object filling these criteria is bound to become a collectible. And insulators are no exception. Some people collect them just to have some pretty colored glass sparkling in their windows or out in the garden; while other people collect specific kinds of insulators. Insulator prices can range from free to the tens of thousands of dollars for extremely rare specimens. With some insulators, only a few surviving examples are left today; these would be the $20,000 and up price range - while others are still so common and so many of them have survived that you can often get them for well under a dollar (sometimes even free) at any flea market table. Here, a Giant Insulator Mouse (Rattus insulatii), weaves deftly between petticoats in her search for used insulator pins and elongated drip points. Finding none here, she seeks refuge inside the couch for her daily siesta. 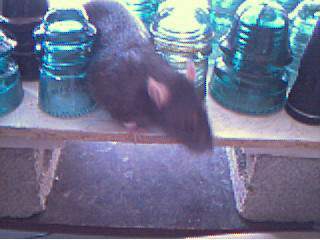 Rats and insulators really can get along. Q: Where do I get insulators, and where can I get information about them? A: If you're able-bodied and live near old train tracks, chances are there are insulators there, free for the taking. Look for old downed poles; especially in areas where brand spanking new poles have just gone up. Many of the old poles are left there, and are just loaded with insulators in all different shapes, sizes, and colors. But watch out for trains, especially (!) if the train tracks aren't completely rusted over. This indicates the railroad line is still in use! You can also get them at flea markets, auctions, estate sales, garage sales, antique shops, and at insulator shows (yes, they have sanctioned shows about insulators!). Wheelchair? Then you're probably out of the insulator-hunting game, but you can still get them at garage sales, insulator shows, and other places mentioned above. Climbing poles to get insulators is a very bad idea, unless you know exactly what you're doing. It isn't worth being electrocuted for a piece of glass. It is common practise to take insulators from old poles that look dead - it is also common practise to bring along cheap, common insulators (such as Hemingray 42's), so when you unscrew one from the pole, you replace it with one of your cheapies. That old wire might still be carrying phone calls. You should never undo a wire from an insulator unless you're prepared to replace the insulator with another. And never do this on electric power lines! More information about insulators and collecting them can be found at http://www.insulators.info and http://www.crownjewelsofthewire.com. Here you will find all kinds of resources to get you started in the fascinating hobby. Learn their history, who makes them, who collects them, how to care for them, display ideas, other collector's web pages (like this one), and so much more.